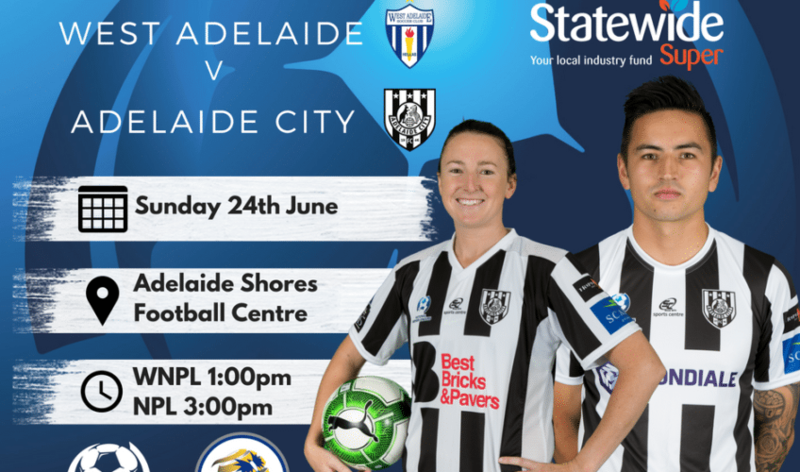 Adelaide City meets West Adelaide this Sunday in a mouthwatering double header at Adelaide Shores Football Centre which will feature our men’s and women’s National Premier League teams. West Adelaide and Adelaide City will meet for the second time this season. 8th placed West Adelaide suffered a 5-2 loss in last week’s match of the round. New singing Theo Balomenos was on the scoresheet in his debut game for the blue and white. He scored in the 54th minute to put his side back in it. New team mate Matthew Bouzalas tried to do the same in the 71st minute, but Metro proved to be too good on the day. West Adelaide also handed a debut to Mateusz Kuzmicki, who also left Comets to join his team mate Balomenos at the club. In round 5 of this year, West Adelaide were beaten 4-0 by their opponents this week, Adelaide City. Karatzas and his side will be hoping for a different result this Sunday, with new depth to squad, this may help West Adelaide for the remainder of the season. 3rd placed Adelaide City will be hoping to emulate the same result in round 5 this Sunday afternoon. City were 4-0 victors back in March. Valentino Yuel opened the score line in round 5, putting his side ahead in the 13th minute. Team mate Nicholas Bucco doubled the score in the 25th minute, with Anthony Costa making it three in the 31st minute. Costa wasn’t finished then, netting his second of the day in the 77th minute. Costa has scored 12 goals this season, losing his golden boot top spot to Christian Esposito of MetroStars. Last week, City had to settle for a 1-1 draw with Adelaide United at home. Being 1-0 down for most of the match, Shannon Day put his side level in the 73rd minute and escaping with a point. Sunday afternoon will see the second double header in a row, when West Adelaide host Adelaide City in the WNPL at Adelaide Shores Football Centre. 3rd placed West Adelaide are seven points behind 2nd placed Adelaide City, so a win on Sunday will close the gap on the 2017 champions. West Adelaide lost their round 14 match, when they went down 2-1 to Metro United WFC. Christie Hillyer was able to put her side level in the 51st minute, but West Adelaide were unable to hold on for a draw or convert any other chances for a win. In round 10, they drew with Adelaide City 2-2 at Adelaide Shores Football Centre. Georgia Macri and Nicole Tilley both scored on the day, but a point was shared between the two clubs. Christina Papageorgiou has been West Adelaide’s highest goal scorer this season, scoring six. However, team mates Hillyer, Marci and Tilley have all done their bit scoring five each. Adelaide City will be looking to jump into top spot when they face West Adelaide this Sunday. City enjoyed a 2-0 win over Salisbury Inter last Friday, as Georgia Campagnale and Tiarn Powell were both on the scoresheet. City’s attacking power is like West Adelaide, as Michael Hatzipanagiotis’ side have been deadly up front. Powell, Di Bartolo and Dawber have all combined for 30 goals, with City scoring 46 this season. In round 10 against West Adelaide, Daniela Di Bartolo’s scored one of her 10, Dylan Holmes also added to the scoresheet, making sure her team got a point in the 2-2 draw. West Adelaide and Adelaide City will kick off at 1pm, before the men’s match at 3pm.